Vodafest 2013 - Save the date! I believe that you are looking forward to the next Vodafest which is fast approaching. 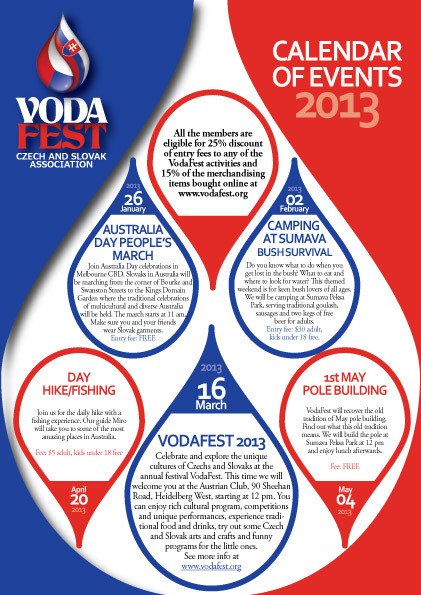 Vodafest 2013 will be held on 16 March 2013. The third make of the festival will be held during the Victoria’s Cultural Diversity Week. This week full of celebrations is an opportunity for all communities living in Melbourne share their cultures, religion and language and to celebrate the benefits multicultural society brings to Victoria. Multicultural events, festivals, concerts and fundraising dinners will be held at various locations in Melbourne during this week. We are glad that Vodafest - Czech and Slovak festival will be one of them. The new committee of Vodafest Association would like to express a special thanks to Sumava Peksa Park for their generous support and help with organisation of the two past festivals. 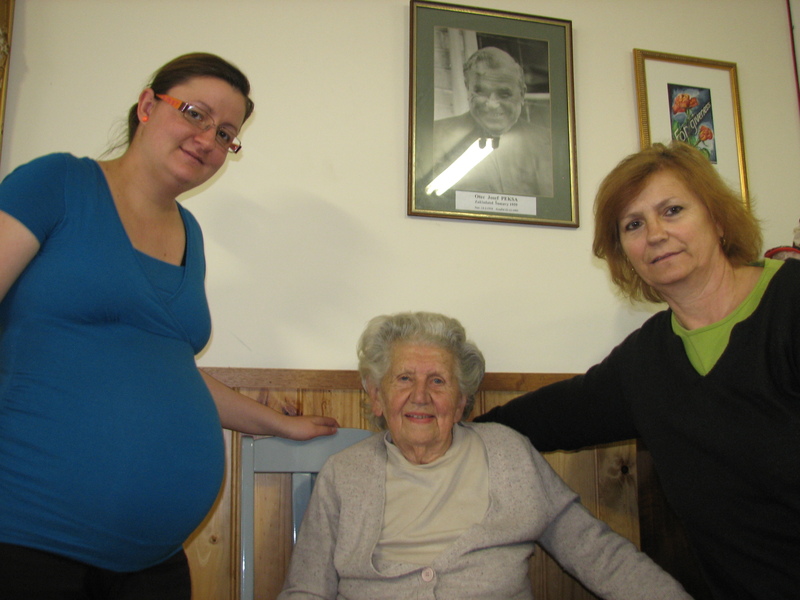 Special thanks belongs to Alena Semecka, Helena Kolnik and Franta Vana for their valuable advises and willingness to help with festival preparations at all times. The Committee also thanks to all the board of trustees and other supporters from Sumava Peksa Park. What does the Vodafest logo means? Many believe that the logo represents the extreme weather associated with the past two Vodafests. In 2010 we had enjoyed a heavy rain and a year and a half later we experienced the 40 degree heat. I can assure you that the weather has played no role in the development of Vodafest logo. 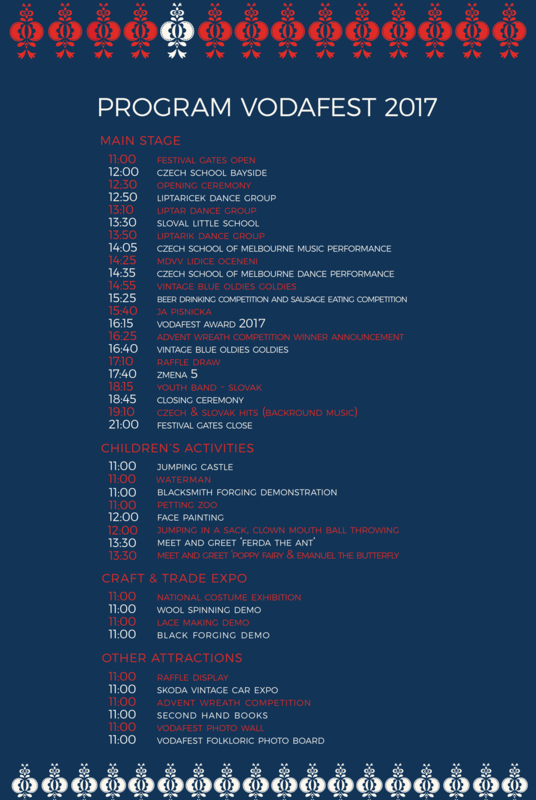 The symbolic drop of water composed of two national flags - the Czech and Slovak, represents a vision of Vodafest to represent our two cultures in a multicultural and dynamic environment of Australia, which could be perceived as a multicultural ocean. We would like to belong to this ocean which is created by many drops. At the same time we don’t want to be just another drop in the ocean but we want to showcase our uniqueness and specific cultures and traditions. As a main activity of our Association, Vodafest 2013 will stay the main focus for the new Committee who already commenced the organisation of the festival and we will regularly update you on its development. Festival organization requires considerable resources and human effort. Areas such as grants, marketing and communications of the festival, permissions and licenses, festival program and activities for children or adults involve some organisational skills and experience. My name is Katarina Tomka and I am a new president of Vodafest – Czech and Slovak Association. I am glad that I can welcome you to this monthly Vodafest blog which I believe will bring you regular news and updates about Vodafest 2013 but also some interesting insight into the happening around Vodafest - Czech and Slovak Association and it’s other activities.